Soundsense Film Productions Pty. Ltd / ABC TV. 1985. Producer: Brian Morris. 2LP (ST) ABC. L-60023-4. 1985. Gatefold. 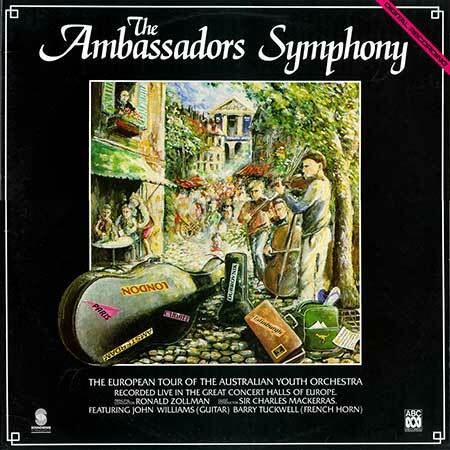 Australian Youth Orchestra. Principal Conductor: Ronald Zollman. Guest Conductor: Sir Charles Mackerras. Featuring John Williams (Guitar). Barry Tuckwell (French Horn). Recording Engineer: Michael Gissing. Producer: Brian Morris. FIRST VIOLINS: John Ridgers - Leader, Elizabeth Collins, Lorraine Hook, Monique Curiel, Joanna Lewis, Roland Adeney, Amanda Scott, Richard Claxton, Sharon Campbell, Christine Lawson, Deborah Goodall, Danielle Jaquillard, Alexandra D'Elia Stender, Hilary Bruer, Bronwyn Myers, Susan Collins. SECOND VIOLINS: Warwick Stengards, Virginia Hunt, Rosalin Lazaroff, Kemeri Spurr, Richard Westphalen, Adrian Keating Jillianne Bartsch, Peter Grimshaw, Lesley Larkum, Christine Marnane, Belinda McFarlane, Maria Lindsay, Andrea Aldam, Angela D'Elia Stender. VIOLAS: Brett Dean, Andra Darzins, Anne Rodda, Barara Hornung, Christine Jarczewski, Andrew Paskowski, Heather Betts, Margaret Pestorius, Andrew Metaxis, Valmai Coggins, Damien Holloway, James Lea. CELLI: Rosanne Hunt, Belinda Manwaring, Jacqueline Curiel, Siobhan O'Shaughnessy, Rita Woolhouse, Jennifer Stokes, John Benz, Ian Phillis, Robyn Hancock, Dale Brown. DOUBLE BASSES: Ian Webber, Catherine Morris, Belinda Goffin, Kees Boersma, Jennifer Penno, Katie Woods, Louisa Searle, Christine Reitzenstein. FLUTES: Wendy Quinlan, Lisa-Marie Amos, Luconda Woodend, Laura Chislett. OBOES: Eve Newsome, Diane Doherty, Grant Dickson, Althea Ifeka. CLARINETS: Catherine McCorkill, Grania Burke, Bradley Millard, Michael Beare. BASSOONS: Wendy Cooper, Louise Howden, Stephen Black. HORNS: Anthony Bishop, Russell Davis, Robert Gladstones, Wesley Chong, Robyn Smiles, Karyn Dobbs. TRUMPETS: Maureen Carr, Terri Anderson, David Lewis, David F. Pye, TROMBONES: Ian Denbigh, Brendan Collins, Janine Pero - bass. TUBA: Francis Barzyk. TIMPANI: Adrienne Badcock. PERCUSSION: Timothy White, Craig Evans, Peter Neville, David Pye. HARP: Lyn Williams. PIANOFORTE: Guy Noble. © 1985 Aust. Broadcasting Corp.
Roman Carnival Overture. (10:15). (Berlioz). Concertgebouw, Amsterdam. Conducted by Ronald Zollman. (Non-Copyright). Horn Concerto No.2 (Excerpts). (5:10). (R. Strauss). Soloist Barry Tuckwell (French Horn). Charles Mackerras. (Boosey & Hawkes/Gema). Russlan And Ludmilla. (5:45). (Glinka). Festival Estival, Paris. Conducted by Ronald Zollman. (Non-Copyright). Romeo And Juliet. (16:15). (Original Version). (Tchaikovsky). BBC Proms, Albert Hall London. Conducted by Sir Charles Mackerras. (Non-Copyright). County Derry. (4:40). (Grainger). Festival Ljubljana. Conducted by Ronald Zollman. (Allans). Concierto De Aranjuez (3rd Movement). (4:55). (Rodrigo). Soloist John Williams (guitar). Conducted by Ronald Zollman. (Biem). BBC Proms, Albert Hall, London. Conducted by Sir Charles Mackerras. (Boosey & Hawkes/SDRM). Sun Music II. (6:00). (Sculthorpe). BBC Proms, Albert Hall, London. Conducted by Sir Charles Mackerras. (Boosey & Hawkes). (Hurst). (Waltzing Matilda: Click Go The Shears). BBC Proms, Albert Hall, London. Conducted by Sir Charles Mackerras. (AMCOS).